England welcome Portugal to Wembley in their final warm-up match before Euro 2016 and they could go face to face - if all goes as expected - in the quarter finals of the tournament. 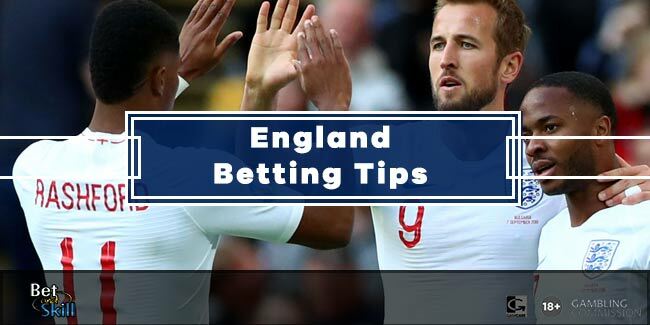 Find below our ENGLAND v PORTUGAL betting preview with predictions, match tips, enhanced odds, probable lineups, bookie offers and no deposit free bets on the Three Lions' match. The Three Lions are on a five game winning streak since November 2015, as they defeated France 2-0 at home and Germany 3-2. Their last 3 games against Netherlands, Turkey and Australia all ended in a 2-1 win for Hodgson's men. They have won 11 of their last 12 home matches and are now rated by the bookies as the 4th favourites to go all the way behind only the hosts France, the world champions Germany, and the defending champions Spain. England have cut Andros Townsend, Danny Drinkwater and Fabian Delph from the preliminary squad, while Daniel Sturridge is a doubt with a calf problem. Roy Hodgson could bring Danny Rose, Kyle Walker, Gary Cahill, Joe Hart, Dele Alli, Eric Dier, Jack Wilshere, Wayne Rooney and Harry Kane into the starting XI for this game. Hodgson must also make a decision as to whether he plays with a 4-3-3 or a 4-4-2 diamond, but in either scenario captain Wayne Rooney is expected to start for the first time in the warm-up games. Portugal come into this match off the back of a 3-0 home friendly victory against Norway last weekend altough they were without team star Ronaldo. They enjoyed a good Euro 2016 qualifying campaign with 7 wins of eight matches in the and topped a five-team group that included Denmark, Serbia, Albania and Armenia. Fernando Santos' men have won 3 of their last 5 games, losing to Russia and Bulgaria in 1-0 defeats. Cristiano Ronaldo and Pepe have both been given an extended resting period following their success in the Champions League final. Without Ronaldo, it will be another chance for Sporting star Joao Mario to impress in Portugal's attack. Anyway, we expect Eder to lead the line while Jose Fonte looks set to partner Bruno Alves at the heart of the defence. ENGLAND (4-4-2): Hart – Rose, Cahil, Smallings, Walker – Barkley, Henderson, Sterling, Milner – Rooney, Kane. Price boost! 6/1 England to beat Portugal. Max bet €/£10. Double boost - 6/1 England or 12/1 Portugal to win! BTTS boost! Get 6/1 England & Portugal both to score + £10 free! 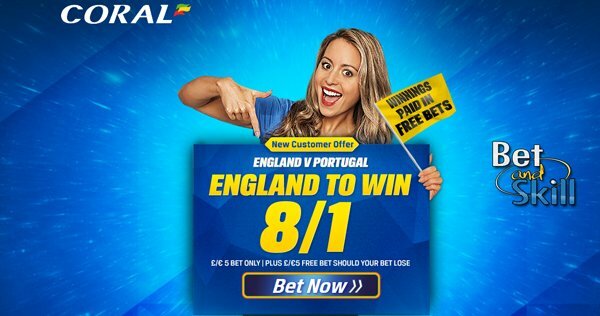 Coral offer 8/1 England to win + £5 if you lose! "England v Portugal predictions, betting tips, lineups and odds (International Friendly - 2.6.2016)"